SUPER CONVOY is our slip-resistant coating perfect for any slippery area like steps, shower rooms, diving boards and pool coping. This high-solids two component epoxy coating offers a slip-resistant profile while remaining comfortable to your feet. 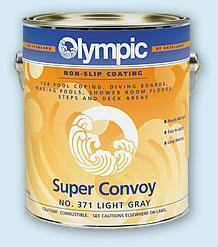 Super Convoy offers excellent slip resistance with fortitude against oil and chemical exposure. Super Convoy is designed for indoor or outdoor application including heavy foot traffic and offers excellent slip resistance with fortitude against oil and chemical exposure. It can be applied to virtually any surface and remains durable for years and years. Available in 7 Colors: Tile Red, Yellow, White, Black, Dark Gray, Light Gray, and Green. 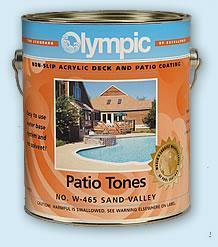 PATIO TONES will greatly enhance the beauty of any concrete patio or pool deck. Plain or worn concrete gives a dull and uninteresting appearance, detracting from the ambiance of the area. PATIO TONES adds life as well as protection. PATIO TONES is also excellent for the restoration of sprayed and patterned concrete surfacing systems. Simply make any necessary repairs, clean the deck according to label instructions, and roll on PATIO TONES. The acrylic formula lets you prepare and coat in one day. The result will be a surface that is safe, beautiful and protected. Available in these attractive colors: Ivory, Champagne, Warm Biscuit, Silk Straw, Desert Sun, Sand Valley, Mystic Grey, and Creekstone. DURACOURT Outdoor Court Coating is an easy to use, one-coat tennis court finish for asphalt and concrete surfaces. This product exhibits outstanding durability and color retention. 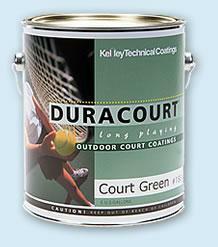 DURACOURT coatings may also be used to resurface previously coated courts with excellent results. DURACOURT is also perfect for basketball courts or any recreational surface. Colors available are green, tile red and white.